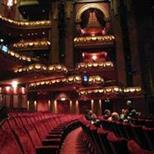 Sorry, there are no shows on sale at Prince Edward Theatre right now. The Prince Edward Theatre is a West End theatre situated on Old Compton Street, just north of Leicester Square, in the City of Westminster. The theatre was designed in 1930 by Edward A. Stone, with an interior designed by Marc-Henri Levy and Gaston Laverdet. Named after Prince Edward (then the Prince of Wales, briefly Edward VIII and later Duke of Windsor), it opened on April 3, 1930 with a performance of the musical Rio Rita. Other notable events in its opening years included the London debut of famed cabaret artiste Josephine Baker, who performed her famous 'Bananas Dance'. In 1935, Stone converted the theatre to a dance and cabaret hall, being renamed the "London Casino". In 1942, stage alterations were undertaken by Thomas Braddock, re-opening as the "Queensberry All Services Club" in 1942 - a club for servicemen, the shows were broadcast on the BBC. After the war, the architects T. and B. Bradock restored the building to theatrical use, becoming the "London Casino" once again - when the King of Yiddish Music Leo Fuld hit the stage. In 1954, the same architects converted it to a cinema, reopening as the "Casino Cinerama Theatre". In 1974, the theatre was acquired by impresario Bernard Delfont, and a new screen installed at a cost of ú150,000. Four years later, in 1978, it was converted back to a theatre, by RHWL Architects and given its original name, reopening with the world premiÞre of the musical Evita on 21 June 1978. Further renovations were undertaken by RHWL in 1992-93, increasing the size of the stage, reopening 3 March 1993 with a revival of Crazy for You. The ABBA musical, Mamma Mia! premiÞred here on 6 April 1999, transferring to the Prince of Wales Theatre, after a five year run. Owned by the Delfont Mackintosh Group, and with a capacity of 1,618, it currently hosts Jersey Boys which opened 18 March 2008. Until 12 January 2008 it hosted Mary Poppins, before the show toured. The nearest Tube station is Leicester Square which is around 300m away. Tottenham Court is about 400m away too. The closest train station is Charing Cross which is approximately 550m away. Buses that run near the theatre: 3, 6, 9, 12, 13, 14, 15, 19, 22, 23, 38, 88, 94, 139, 159, 453. There are meters on Soho Square. There is also a Masterpark at China town and Poland street. Also there is an NCP at Wardour Street, Denman Street, Newport Place and Brewer Street. Entrance to the auditorium through a double EXIT door opening outwards on Greek Street, then up a very short ramp to Box 1 where there are 2 spaces for wheelchair users and 2 companions. Transfer seating is available to row A. The theatre is able to store a maximum of 2 wheelchairs and one scooter per performance, next to the EXIT door. An Access rate is available for wheelchair users and Patrons who have specific access requirements. To discuss your visit and availability please call 0844 482 5137. Headsets are available from the Access attendant for a ú5 refundable deposit. Two guide dogs are permitted access to the auditorium per show. The venue staff can also dog-sit if this is arranged in advance. For any queries and to book please call 0844 482 5137.